We are a Sports Technology Platform digitizing sports ecosystem by adding value to all the stakeholders such as Clubs, Associations, Academies, Coaches, Trainers, Parents, Individual Sportsmen and Sportswomen. One-stop technology platform for all stakeholders in the sports value chain across hierarchies and geographies, enabling them to realize their full potential and positively contribute to a strong and structured growth of the ecosystem. 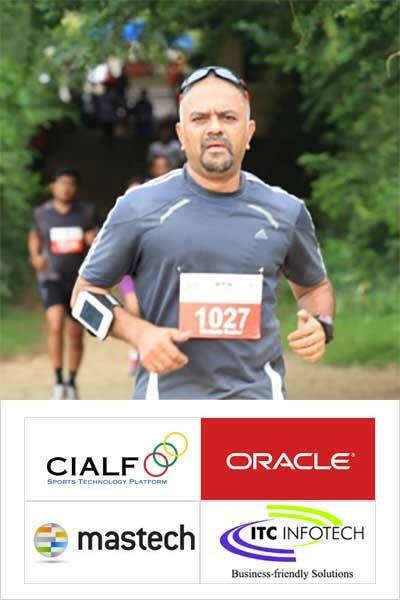 The name CIALFO is derived from the Olympic Motto Citius, Altius, Fortius, which is Latin for “Faster, Higher, Stronger"
Close to 18 years with Oracle India and Oracle USA. 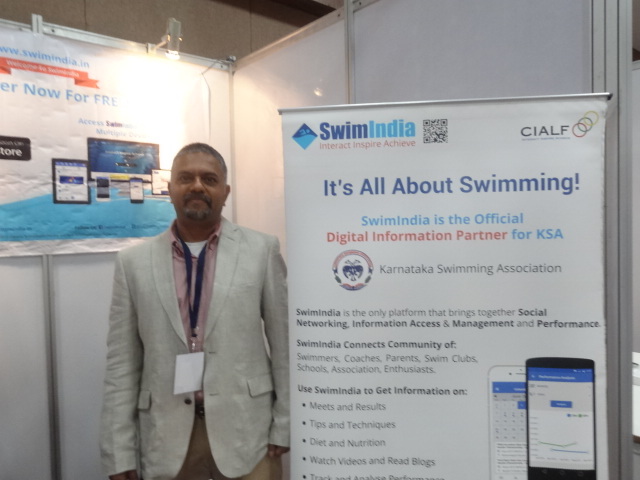 SwimIndia is an ideal platform for the Swimming Community, originated from CIALFO Solutions Private Limited, the Sports Technology Platform. Created with a focus to bring a social networking platform for the swimming community to learn, interact and network, SwimIndia promotes a sporting and a swimming culture by providing usable information like tips, training and diet information, useful information about swimming clubs, training centres, academies. SwimIndia bridges the lacuna that existed in the swimming world by bringing together the Key Stakeholders of the Swimming Ecosystem as one Swimming Fraternity – the Swimmers, Enthusiasts, Parents, Coaches and Swimming Clubs. The launch of SwimIndia fulfills the objective of providing progressive opportunities for the swimming fraternity to enhance their understanding and knowledge about various aspects of swimming. 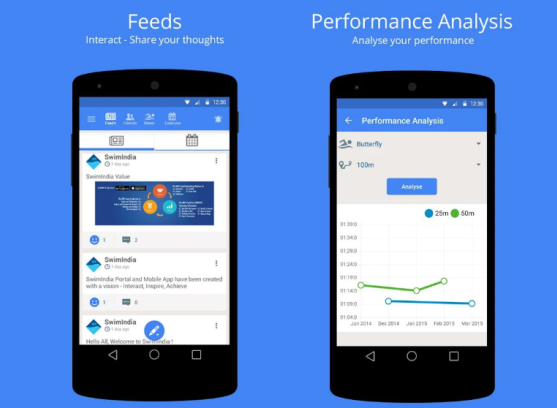 The beneficial solution provides Community Interactions, Social Media Sharing, Information Access & Performance Analysis through its Website, Web Application as well as Mobile Application. Does Sports excite you ? Do you want to join the team that is trying to bring in a change to the sports ecosystem in India ? We would love to have you on board. If you have the skills to develop Mobile Applications on Android or iOS platforms, please get in touch with us. We are also looking for Marketing professionals who interact with our Users, Customers and Partners. We welcome and encourage internship applications from students specialized in Marketing and Mobile Application Development as well. Go ahead and Contact Us. 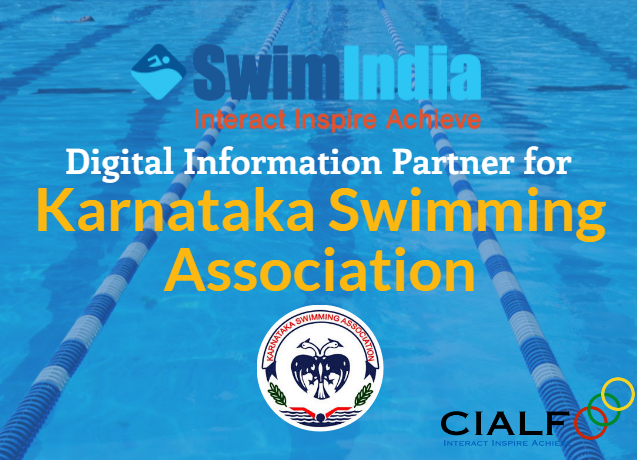 SwimIndia served as the exclusive digital partner for Sub-Junior and Junior National Meet held in Bengaluru, in association with Karnataka Swimming Association. The involvement in complete coverage of the national meet was also in partnership with Glenmark Aquatic Foundation and leading brands like Speedo, SportsDrive.in, Search Foundation. SwimIndia digitized meet information and covered State Sub-Junior & Junior Meets for Karnataka, Madhya Pradesh, Kerala, Tamil Nadu, Maharashtra, Andhra Pradesh and Telangana. Also provided Live Streaming of the Karnataka State Sub-Junior & Junior Aquatic Championship 2016 held in Bangalore. 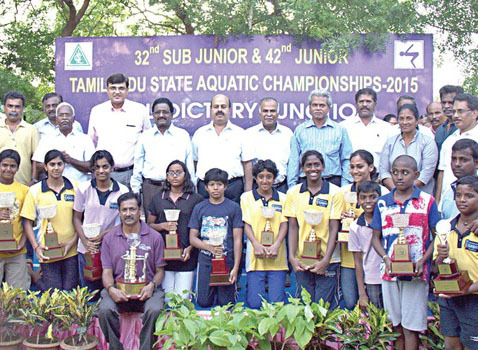 The Tamil Nadu State Aquatic Association 33rd Sub-Junior and 43rd Junior State Aquatic Championship – 2016 held in Chennai from 3rd – 5th June 2016. 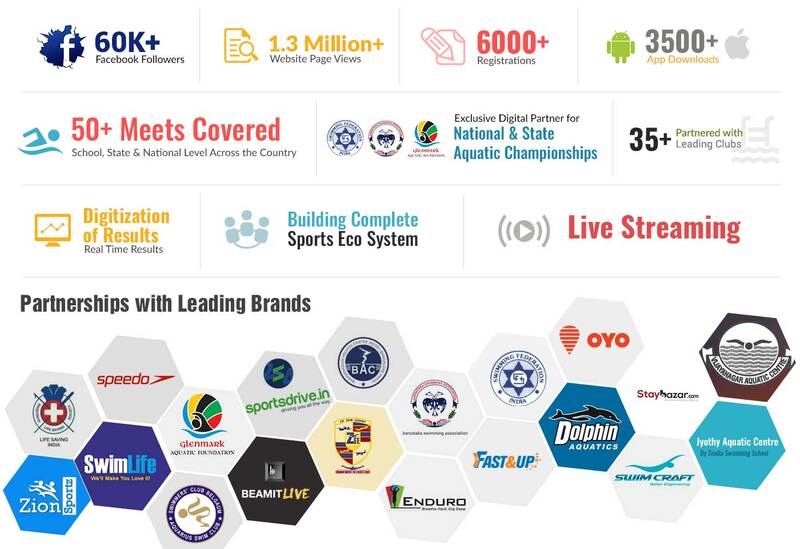 SwimIndia provided significant online promotional services and raised the visibility and number of registrations for National Lifesaving Sports Championships, the ‘Rescue INDIA 2016’ National Pool, Beach & Ocean Lifesaving Sports Championships held in Mumbai from 25th to 28th May 2016. SwimIndia was also a part of the Open Swimming & Diving Championship 2016 Mumbai, held in Otters Club, organised under the auspices of Greater Mumbai Amateur Aquatic Association (GMAAA) on 16th and 17th April 2016. 1) At multiple locations in Bangalore by SwimLife Swimming Academy. 2) By Vijayanagar Aquatic Centre at Bengaluru starting 2nd April 2016. 3) By Glitzy Swimming Pool from 30th March 2016. SwimIndia played a vital role in reaching out the swimming community with all meet-related information for the Indo-Sri Lanka Invitational Masters Swimming Meet 2016. The meet was organised on 3rd and 4th March 2016 by SwimLife, Bangalore, India in collaboration with Rainbow Aquatics, Colombo. The Visakha Swimming Pool Complex in Colombo, Sri Lanka served as the venue for the meet. SwimIndia is created with a vision Interact, Inspire, Achieve - SwimIndia is the only platform that combines the capabilities of Social Networking, Information Access & Management and Performance Management. SwimIndia brings together Swimmers, Coaches, Parents, Swim Clubs, Associations and Schools. wimIndia gets featured in Bangalore Mirror today, 23rd December 2015. Bangalore Mirror is one of the Special Interest offerings of The Times of India –the nation's leading media conglomerate. 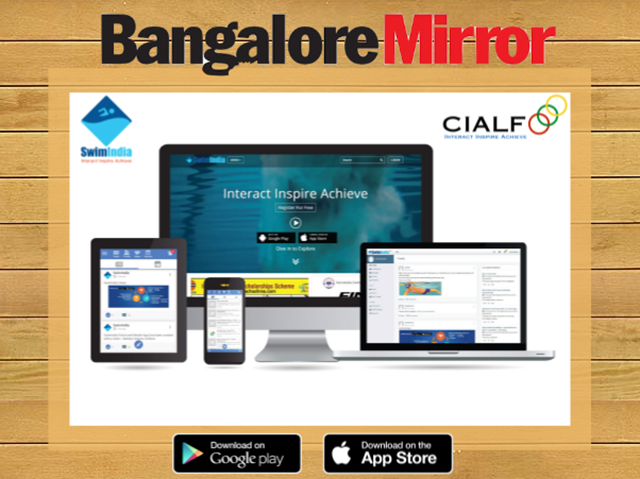 In the article titled “Sporting App for Swimming Enthusiasts,” Bangalore Mirror introduces SwimIndia as the platform developed by CIALFO Solutions Pvt. Ltd.
CIALFO Solutions Pvt. Ltd. participated as an exhibitor at India’s premier IT & Electronics Event Bangalore ITE.biz 2015, jointly organized by Department of Information Technology, Biotechnology and S&T, Government of Karnataka and Software Technology Parks of India (STPI), at The Lalit Ashok, Bangalore. 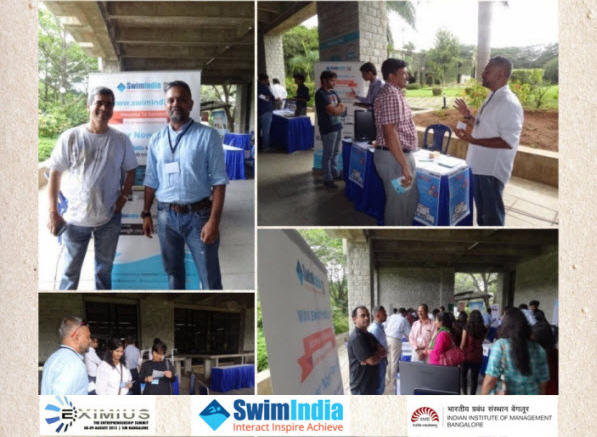 SwimIndia is pleased to have showcased and celebrated the spirit of entrepreneurship @ Eximius, The Entrepreneur Summit, on 8, 9 August 2015 at IIM Bangalore. Eximius, an annual entrepreneurial summit, focuses on unconventional areas of entrepreneurship such as social, political, sports, performing arts and media apart from technology. 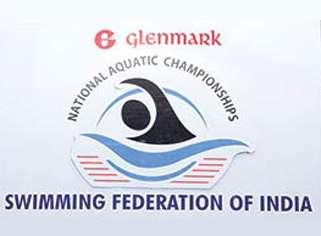 SwimIndia actively took part in the swimming Meet held in Pune – the Glenmark National Sub-Junior & Junior Aquatic Championship - 2015 from 13th July to 19th July and successfully published detailed meet results and useful updates on each day of the meet. The swimming enthusiasts were not only keen to learn about the benefits of the information-rich swimming app, web application and website, but were pleased to adopt them. SwimIndia took an active part in the swimming Meet held in Neyveli – the Tamil Nadu State Sub-Junior and Junior Aquatic Championship – 2015, spanning over a period of 17th June to 21st June. While a number of parents, coaches and swimmers were kept informed about SwimIndia web and mobile app, the event-wise Meet Results were made available on the website. 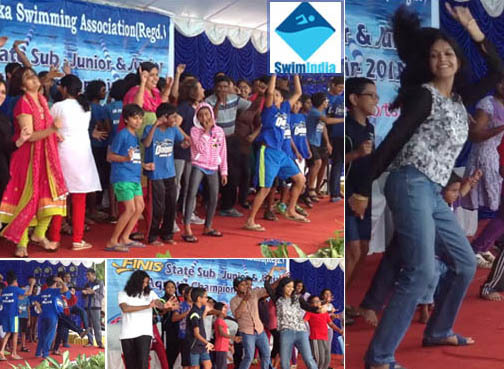 SwimIndia took part in the swimming Meet held in Bengaluru, Karnataka – the FINIS Karnataka State Sub-Junior and Junior Aquatic Championship – 2015 from 8th June to 11th June. Reaching out to swimming enthusiasts, SwimIndia successfully delivered Live Meet Results on each day of the Meet, besides keeping parents, coaches and swimmers informed about the information-rich website, web and mobile application. SwimIndia is chosen as the Start-up of the Week by Start-Up Sutras, a blog for insights on the start-up community, developed and maintained by TiE, the non-profit global community encouraging the next generation of entrepreneurs worldwide. SwimIndia gets featured on StartupCuration, the preferred platform for Entrepreneurs to Create, Manage, Maintain & Validate their Startup. StartupCuration helps Entrepreneurs to spread the word, thereby letting people discover the latest trending startups and their benefits. SwimIndia partook in Showcase, a newly emerged event organized every month by TiE, a non-profit global community, along with eight other startups. The event that took place on 31st March 2015 at Arbor Brewing House, Bangalore, was aimed at helping entrepreneurs showcase their products to invite expert feedback from investors and business leaders. 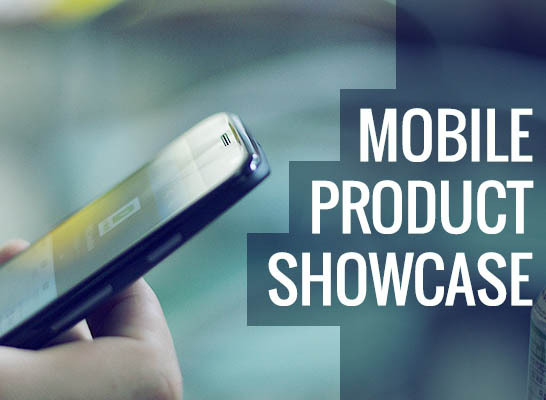 The chosen area of focus for Showcase was Mobile. Copyright © 2016 CIALFO Solutions Pvt. Ltd.